If you think smartphones that come with higher specifications on paper are going to perform way above and beyond compared to devices with a supposed lower specification set, then you really couldn’t be more wrong. You may find yourself consistently buying and using one of Apple’s iPhones as your main smartphone. Or you may be an Android fan who uses the hardware of one of the various manufacturers who build devices for that platform. Or you could even be a user of Microsoft’s Windows Phone, ok, maybe not Windows Phone, but you get the point. Either way, regardless of your platform of choice, it’s always great to see two flagship devices pitted against one another to see which performs better. 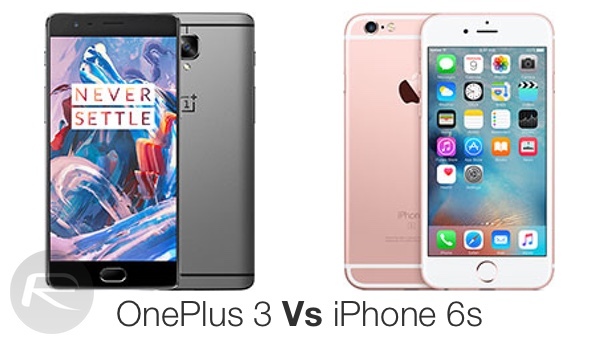 So, with that in mind, will it be the OnePlus 3 or Apple’s iPhone 6s that takes the crown? On paper, the new OnePlus 3 should theoretically be the clear winner in this challenge. It’s a brand new device packing a whopping 6GB of RAM with an accompanying top-line quad-core Qualcomm Snapdragon 820-series processor. The iPhone 6s on the other hand is nearly a year old, has a paltry 2GB of RAM by comparison, and just a dual-core processor under-the-hood. If you look at it from a purely technical perspective, then the Chinese-manufacturerd OnePlus 3 should leave the iPhone 6s in its dust. But yes, you guessed it, Apple’s iPhone 6s may have theoretically worse spec, but it seriously outperforms the challenger, as has been proven many times before. The speed-test video makes seriously interesting watching for anyone who has been considering purchasing a OnePlus 3 device as their next smartphone. It almost seems like it actually struggles launching apps, which let’s be honest, is probably the one thing that most users spend their time actually doing. Not only that, but its memory management and multitasking capabilities appear to be almost non-existent, meaning that the OnePlus 3 had to actually re-launch the apps from a cold start as part of the second lap of the test, this despite having 6GB of RAM. The iPhone 6s on the other hand was able to gain a better advantage over the OnePlus 3 thanks to how it powerfully manages running apps in the background. Check out the video for yourself and see what you actually think. Will the relatively poor performance be enough to prevent you from purchasing a OnePlus 3, especially considering it has been proved to fall short against the iPhone 6s and Samsung’s Galaxy S7? Or, like many others, do you feel that these issues could be eradicated with a future firmware update, leaving the OnePlus as a highly capable device? Now i have Oneplus 3 guys. OK this is amazing phone. I believe this is most amazing Android phone. And i have second phone iPhone 6s Plus.